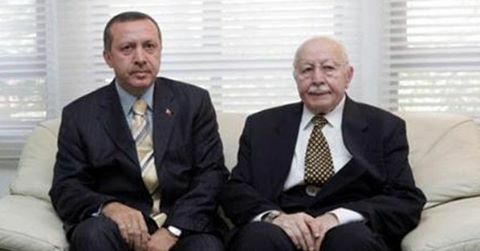 The right man on the picture is Necmettin Erbakan. Erbakan studied machine engineering and wanted to produce cars for Turkey to make the economy better. He made a factory but the government decided to close it. The goverment of these times were puppets of other states. And other states didn't want that Turkey is producing cars and sell it to rich arab countries. He lived in a time were muslims were discriminated by the state and the goverment. People with long beards couldn't be officials. Soldiers and police were to scared to pray in public. Women with headscarf weren't allowed to study in universities, go to school, became officials. The excuse of this discrimination was that: Turkey is a secular country. But even its secular everyone has the right to study and become a official. He became the hope of millions of turks. He created the Milli Görüş Movement which is still excisting nowadays. He created his first political party in 1970 (Milli Nizami Party). But one year later it was forbidden by the government. 1973 he created the Milli Selamet party and was a part of a coalition till 1980. 1980 a coup was made and he was arrested. 1987 he created the Refah party. 1996 his party became the government and he became the prime minister. He gave the muslim population rights again. Woman with headscarps could go to the school again. 1997 a coup was made to him. Than the discrimination began again. Recep Tayyip Erdoğan was in his party too. Erbakan was the teacher of him. After some years Erdogan created AK party with all the students of Erbakan. Erbakan was so intelligent that he said 22 years ago what will happen in Syria. In the comments you can see links how woman with headscarf couldn't enter the school. historyofottoman_In this video a girl who win a literature competition didn't get her price because of her headscarp. historyofottoman_These girls couldn't get their diploma. One of those girls was the best of school and she couldn't get her price. The content is copyrighted to Ramnul ElGug F.R and may not be reproduced on other websites. Diberdayakan oleh Blogger.